One of the titans of the roots reggae movement, CULTURE has withstood the test of time and remains one of the genres most powerful and enduring acts. Staying true to their name Culture's music is dedicated to social, political and spiritual messages. 2018 finds the bands celebrating the 40th anniversary of their seminal album “Two Sevens Clash.” Sounding unlike any other roots reggae records of its time, the album found Culture pushing the roots sound forward as they experimented with big-band swing, funk and and hints electronic music. Hailed as one of roots reggae's true masterpieces, “Two Sevens Clash” is as vibrant as ever with its pleas for justice, calls for peace and deep sense of joy resonating as much now as they did 40 years ago. 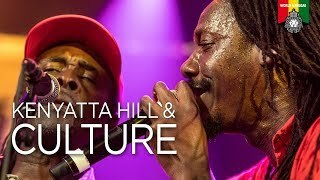 Fuelled largely by the intensely passionate vocal delivery of leader Joseph Hill, the group is rightly viewed as one of the foremost bearers of reggae music and Rastafarian culture, spreading their message around the globe over four decades. Though the group tragically lost Joseph Hill in 2006 after a show in Berlin, his son KENYATTA HILL, who had been working with the band as a sound engineer, stepped up to fill the gaping void left by his late father. The fires that started over four decades ago are as strong, as important as ever. Come celebrate one of reggae music's landmark achievements with us. CALEB HART & THE ROYAL YOUTHS will be providing direct support to Culture on this very special night. One of the west coast's finest reggae bands, this incredible group of musicians is tending the roots of reggae music here on the coast, helping further prove that the reggae spirit transcends borders and can flourish anywhere. Making her Ska & Reggae Festival debut on this night is the powerful ERICA DEE. Dee's diverse talents combined with a deep knowledge of and passion for an endless array of genres make her sets dynamic musical journeys that are as unpredictable as they are satisfying. Holding things down between sets will DJ ROSSCO, one of Vancouver's most renowned Afrobeat DJs. The Nigerian-born DJ wasted little time in making his mark on the west coast as a go-to for some of the finest in Afrobeat, dancehall, hip-hop and trap beats.